More information on the ultimate guide to pet adoptions at HomeoAnimal.com here. This entry was posted on Sunday, August 19th, 2012 at 19:59. It is filed under Life, Uncategorized and tagged with animal shelter, Cat, Coquette, Downey, Fleurette, kitten, kitty, Loran, rescue. You can follow any responses to this entry through the RSS 2.0 feed. I’m so glad you adopted these two together. 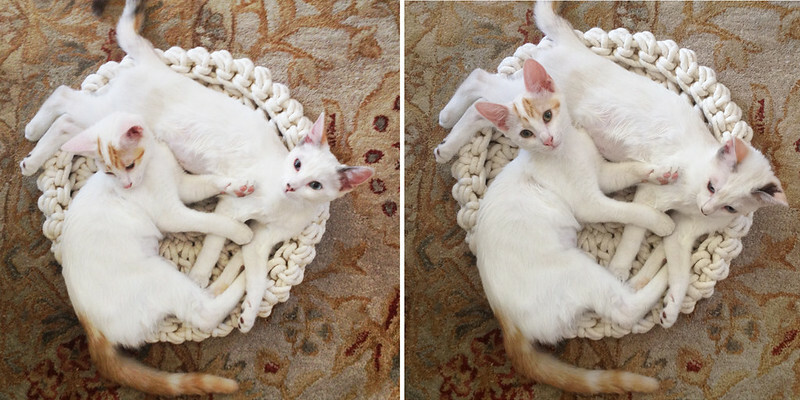 Before they were at the home you adopted them from, our family fostered them with their brother for about a month. Their previous names were Blossom and Bubbles, and they were a delight. All three kittens would suckle on one another’s fur, sometimes in a circle (I assume they were taken too soon from Mom). They have always been gentle, sweet, and playful. Both are very good with my big dog, in case that figures into your situation (I looked around your blog and saw Didi on a leash–I think they would do well meeting dogs). If you’d like, I can send you a few younger pictures of your girls. Thank you for keeping them together. Ellen C – I thought I had replied to this last week but cannot seem to find the reply! Thank you so much for letting me know about the girls! I am so thankful we have them, they are such a joy! I only wish now we could have their brother with them but I am sure he went to a good home. The two of them still suckle each other – so cute. I would LOVE to have photos of them a tiny kittens. Thank you so much for fostering. You are a saint.